Microsoft periodically releases cumulative updates and service packs for SharePoint. 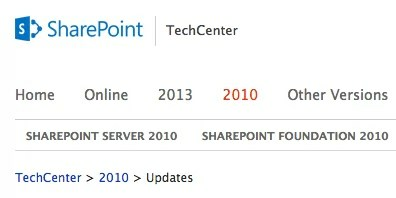 Just few weeks ago, SharePoint 2010 Service Pack 2 was publicly released. Bookmark this TechNet page, http://klo.pm/1cuCOjN, if you have not already! Cumulative updates are patches that fix known issues. As implied by their names, they are cumulative in nature and typically incorporate, to a large extent, the previous updates. However, always read the fine print! Since Cumulative Updates are cumulative, you don’t need to install all of them immediately. Instead, you should just install updates that addresses the specific issues at hand. You can reduce server downtime by setting content databases to read-only while installing the binaries right before applying the patches. Doing so lets your users access the SharePoint servers through the beginning of the update process and only experience downtime towards the end of the process. Service Packs add new features to SharePoint. These are significant and high-impact upgrades and must be handled with extra caution. You should always test each Service Pack first in a test environment extensively. In addition, it is imperative that you create a complete backup of your content and configuration databases. If you are using virtualization, take some snapshots of your Web Front End and Application servers(s). These best practices should make your life a lot easier! Give us a call to learn more about updating SharePoint! Cheers!